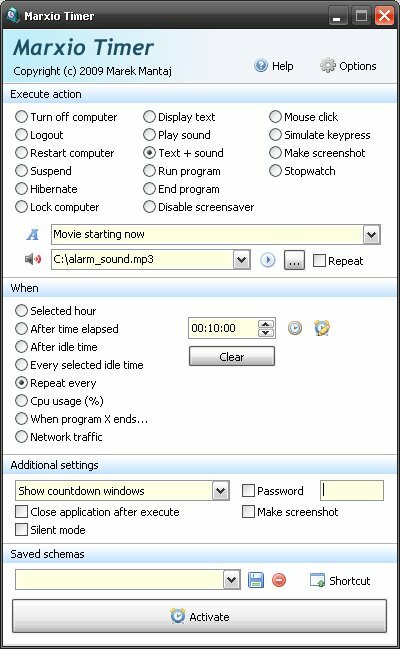 Marxio Timer is a powerful timer and reminder tool which executes scheduled tasks 15 taska, like turn off PC, restart, lock screen, display text, run or close selected application at any time you want: after n minutes, before, every, after idle time, every idle time, once, cpu triggered. Marxio Timer includes a very interesting feature: the ability to save user profiles and even create a desktop shortcut for them for quick start of created tasks. A free, powerful, multi purpose timer, reminder and scheduler tool. * when network traffic (upload, download, total) is below or above selected value. Qweas is providing links to Marxio Timer 1.12.3 as a courtesy, and makes no representations regarding Marxio Timer or any other applications or any information related thereto. Any questions, complaints or claims regarding this application Marxio Timer 1.12.3 must be directed to the appropriate software vendor. You may click the publisher link of Marxio Timer on the top of this page to get more details about the vendor.